In the middle of the Russia Day celebrations on June 12, a giant alien spaceship threatens the country. 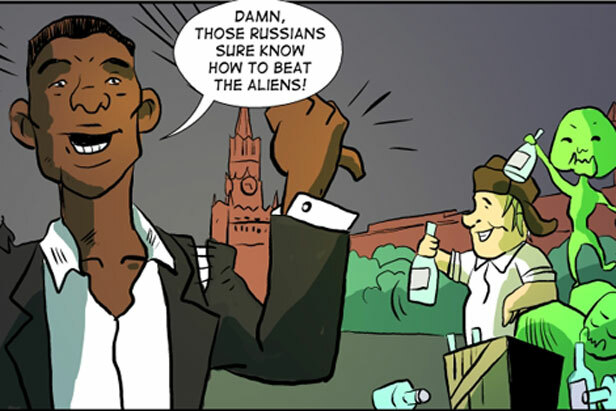 Hollywood actor Will Smith, in Moscow on a promotional tour, tries to fight back (Independence Day-style, of course! ), but he is taken as a prisoner. It is now up to French actor Gerard Depardieu, who has recently acquired Russian citizenship, to save Will Smith and the entire country from an alien invasion. He hides inside a matryoshka Trojan horse with a stash of party supplies… Will his ingenious plan work?